On a clear day, residents all over Calgary are waking up to sunlight pouring through their windows. When you start to notice that sunshine isn’t so bright, don’t hesitate. 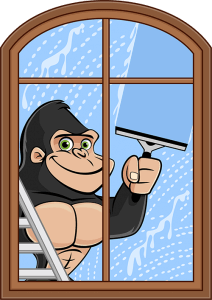 It is time to call in our Gorillas for your Calgary window cleaning. It is easy to neglect the quality of your windows, but as time goes on, their importance begins to show. Your windows ask for help in more ways than one. Even though it may not be obvious, your windows are contributing factors to your heating system, air condition, lighting and household bills. Throughout the course of your days, months and seasons, environmental factors such as wind, rain and snowfall allow dirt and debris to collect along the surface of your windows. The porous surface of your glass allows these bits and pieces to penetrate the surface and degrade the glass from the inside out. There is no set life-span for your windows! By maintaining a routine of proper maintenance, you can get the most out of your glass! Our Calgary window cleaning is available for both commercial and residential properties that are three storeys or under. In addition to providing Calgary residents with a clearer picture, our Gorillas can provide peace of mind by having a trained eye on the condition of your windows as a whole. Instead of climbing a ladder for a chance at a marginally clean window, trust in our local services in order to get the best results the first time! Our Gorillas operate safely, efficiently, friendly and insured. What is not to love?! Call today to speak with one of our Gorillas and find out how our Calgary window cleaning can benefit you. Appointments are available online or by phone.